For the ultimate in luxury why not treat yourself to the Apple day bed for the coming summer? With the ability to fit 2-4 people, this daybed offers the ideal day bed for relaxing in absolute comfort. 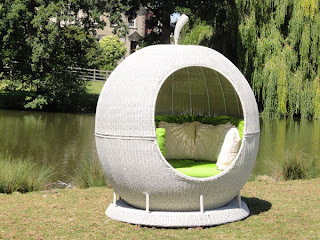 One thing is for sure, with the apple daybed in your garden you can be certain you will be the envy of all your friends. Featuring a rotating base allowing it to swivel 360 degrees it gives you the option of not having to miss out on any of the suns warm wonderful rays on those blissful hot sunny days as you simply reposition the daybed wherever you want it to be. With a removable top half you can sunbathe easily, and when it all becomes a little too much you simply pop the top back on for a relaxing snooze in the shade knowing you are safe and protected from the sun. The ecolene manufactured bed features 6mm diameter cappuccino weave and a bedrock fabric to ensure you stay relaxed and comfortable all day long. Whatever size garden you have daybeds are becoming more and more popular for use in the summer sun, and the Apple day bed is just about the most sumptuous available today, offering luxury you will not easily find elsewhere. Available in either cappuccino or white this apple day bed makes for a most stunning focal point in any outdoor area, being versatile enough for sunning yourself, for relaxing with a drink or even for having a sleep in. 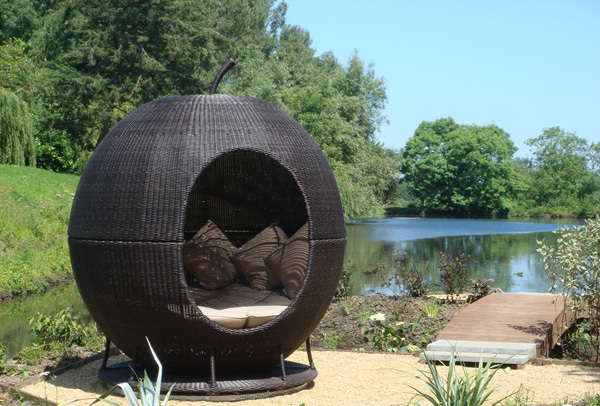 With the ability to withstand the worst of the weather conditions the UK climate can throw at it such as heavy rain and extremes of temperature, thanks to its ecolene material structure the rattan manufactured apple day bed is the perfect accessory to any sun lovers garden. 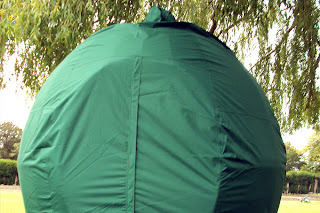 With covers for the seats and scatter cushions being removable for washing and a UV resistant waterproof heavy duty polyester cover which includes taped seams you can be sure you are getting a product that can withstand the worst of the weather. With just a little simple maintenance the apple day bed will stay looking in fantastic pristine condition offering great resistance against mould, insects and dirt. A quick wipe over with a damp cloth regularly will keep your day bed in great condition allowing you many trouble free years of enjoying the sun along with a great product for your garden that will draw plenty of comments from visitors to your home. Measuring up at 2 metres in diameter by 2.3 metres in height it’s ideal for enjoying with company, as well as lazing on with a good magazine and a relaxing drink offering the perfect opportunity to de-stress after a hard day at the office, or just simply let the heat of the day wash over you. If you are considering a daybed for your garden for the forthcoming summer take a closer look at the Apple Daybed. This daybed is one of the most stylish you can find on the market today, along with the practicality required for an outdoor sun lounger.